King of Comedy Dolphy just shrugs off reports that he has already passed away. At age 82, Dolphy continues to enjoy an active career in acting and in music, but admitted that age is nevertheless catching up on him. Aside from recently coming up with a music album, his next movie, Father Jejemon, will be a Metro Manila Film Festival entry this Christmas. However, he said that extra care is necessary because he is prone to over fatigue and ailments. Asked how recording his album Handog Ni Pidol A Lifetime Of Music And Laughter went, he said humorously, "Nahihirapan ako sa recording 'lsquo;pag aakyat ako ng hagdanan." But he quickly added that despite the hardships because of old age, he is still happy with what he is doing. "Hindi naman pahirapan ang trabaho, eh. Nage-enjoy ka naman sa ginagawa mo, 'lsquo;yun ang imporante." 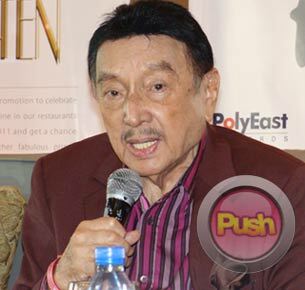 At the press launch of his album, Dolphy also revealed that he is still recovering from pneumonia and is constantly assisted by a nurse while under recovery. "Humina ang lungs ko. Matagal talaga ang recovery ng pneumonia," he shared. In line with his ailment, the King of Comedy said that he is aware of malicious reports that he has passed away. But surprisingly, the veteran actor did not appear outraged by these rumors. "Tinatawanan ko na lang 'lsquo;yung ganun. Ikinikibit balikat ko na lang 'lsquo;yun, ganun talaga. Andaming text, hindi lang ako [ang apektado], madaming taong naapektuhan ng mga bali-balita." Even his partner, ZsaZsa Padilla had the same demeanor when asked for her reaction about these bogus reports. "Wala naman. Sabi nga niya, nagbibiro siya ilang beses na siyang pinapatay sa balita. Kami nandidito lang kami bilang pamilya, sumusuporta sa kanya." The Divine Diva also said that their main concern is Dolphy'rsquo;s health but could not convince the actor to entirely leave showbiz behind after six decades. "It makes him happy, eh. It really makes him happy," she stressed. The singer further explained, "Sabi nga niya semi-retired na siya kasi every time he retires, he still goes back to work." ZsaZsa justified that being a thespian herself, she knows how her partner feels about his untiring love for showbiz. She said that it is through showbiz that Dolphy gets to express his creativity because he cannot appreciate this generation'rsquo;s obsession with Internet and modern technology.